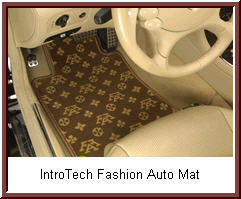 Top Fashion Floor Mats from Intro-Tech for the Most Discriminating Taste. 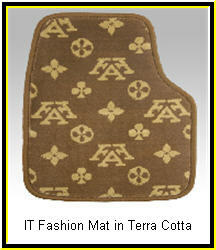 Luxurious Floor Mats make or break the elegant and sophisticated feeling you get when you step into your Toyota or other high end vehicle. These mats are so thick and plush you might have to have your Toyota's floor lowered so your knees don't hit the steering wheel! Don’t leave that feeling you need up to chance. 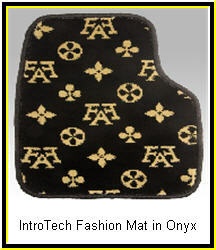 Check out the super luxurious Fashion Auto Mat floor mats from Intro-Tech and let the automobile aficionado come out in you! These mats are made of extra plush 114 oz. polypropylene carpeting that has superior stain resistance and are long wearing. They are double serged around the edges with matching or contrasting yarn to create your own sense of elegance. A nibbed backing prevents these mats from slipping on your vehicle’s carpet. These car mats come in four uniquely colored fashion statement patterns. Tip: Keep these expensive and beautiful mats clean, reduce stains and mold/mildew smells with universal absorbent car mat protectors.